If it's cold and rainy outside, you'll want to wear work boots that keep your feet dry and warm so you can get through the work day. 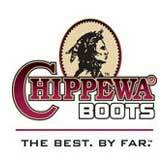 A pair of these Chippewa Men's 55073 Brown Waterproof Insulated Boots will accomplish both. Made with waterproof membranes and lined ... (see full details) (see specifications) #CHP55073. If it's cold and rainy outside, you'll want to wear work boots that keep your feet dry and warm so you can get through the work day. A pair of these Chippewa Men's 55073 Brown Waterproof Insulated Boots will accomplish both. Made with waterproof membranes and lined with Thinsulate Ultra insulation, you'll remain comfortable despite the nasty weather conditions. Even the non-tarnishable hardware, including hooks and eyelets, and heavy-duty, nylon laces will hold up against the elements for added durability. To keep your feet dry, these brown boots feature Chip-A-Tex waterproof booties. The membrane shields lock water out, while still allowing air to pass through from your feet to provide maximum comfort. High-abrasion nylon lining provides additional breathability inside the men's footwear, keeping your feet cool and comfortable throughout your work day. When it's cold outside, 400 grams of 3M Thinsulate Ultra insulation will keep your feet warm in temperatures as low as -45° F with moderate activity levels while wearing these waterproof boots. Thinsulate Ultra insulation provides warmth without the bulk, and it won't compress, lose efficiency, or trap perspiration. Its microfibers are about 10 times smaller than other synthetic insulators, making them ideal for trapping insulating air and reflecting back the body's radiant heat. The material of these Chippewa boots is loftier and thicker than original Thinsulate insulation for even greater warmth and comfort, yet still thin enough to allow complete freedom of movement. The uppers of these insulated boots are constructed of heavy duty, tough bark leather, which is durable and abrasion-resistant. This leather goes through a bark-tanning process - also called vegetable tanning - to create durable, water-repellent leather with a lot of body. Barks contain a bitter ingredient called tannin, which has the property of combining with proteins to form a compound that won't rot or decompose easily. As a result, the leather's physical strength is enhanced, giving it greater body and firmness to provide long-lasting use of water-resistant boots. Also environmentally friendly, Bontex insoles distribute pressure more uniformly to keep you comfortable when you're working. They're designed to be flexible, while maintaining surface absorption for breathability when you wear these men's boots. Meanwhile, the rubber midsoles have excellent low temperature properties, allowing the material to stay supple in cold temperatures. Rubber is very durable and is resistant to bases, acids, alcohols, and diluted water solutions of most chemicals that are water soluble. The bottoms of these 6-inch abrasion-resistant boots feature Chippewa IQ rubber outsoles. To ensure high surface contact, these industrial-quality rubber soles feature an aggressive tread pattern. In addition to offering superior puncture- and cut-resistance for durability, rubber also has superior slip-resistance compared to PVC. This will help to keep you steady on many surfaces while wearing these slip-resistant boots. To enhance the Chippewa footwear's durability, Goodyear storm Welt construction is used to assemble them. The uppers' fabric, linings, and soles are all stitched together, creating a single unit for added durability. Goodyear Welt products are known worldwide as a superior method of work footwear construction. They're extremely tough and provide excellent traction and great lateral stability. You can even have the worn-down outsoles completely replaced as long as the uppers remains sound, giving the leather footwear a life expectancy of 20 years or more. Padded collars not only enhance fit and comfort, but also help to keep trail debris, sticks, and stones out of these slip-resistant boots. There's even steel shanks to provide arch support and keep you more comfortable during the day. These force the appropriate break at the balls of your feet to provide the flexibility your feet need when you're active. Prepare for working in bad weather and order this pair of Chippewa Men's 55073 Brown Waterproof Insulated Work Boots today. When you're warm and dry on the job, you can focus on your work and be more productive all day long. Chippewa has made some of my favorite boots. They are all American made and offer very good value to the money. These boots are great for work especially in colder conditions. They keep my feet warm and dry all the time and the soles do a good job for slipping issues. Highly recommended if you're looking for winter boots. Chippewa Boots: Men's Waterproof 55073 Insulated Brown Leather Boots is being added to your cart.